“Why?” That’s what the kind-hearted little pig turns to his attacker and asks in Babe: Pig in the City, during a scene that has never left my mind since I first experienced it. There are quite a few scenes in George Miller’s masterpiece that have never left me, but this one, this brief moment of haunting beauty, is so packed with layered emotions, with darkness and light, with terror and empathy, with heart and mystification and then with that question – “Why?” – that it’s risen to my consciousness time and time again, sometimes when I least expect it. And it’s something that marked me a great deal more on this recent viewing. It’s a question sweet pig Babe (Elizabeth Daily) seems to be gently imploring an entire world – a mean, crooked, violent world that seeks to destroy outcasts and innocents. It’s a universal question: Why? It’s also a scene so sublimely crafted by Miller that while, yes of course Mad Max: Fury Road is brilliant, innovative, exciting and disarmingly poignant, we should not forget Babe: Pig in the City, a movie that didn’t get its deserved due when released (there is a cult of the devoted, however, and Siskel and Ebert loved the film at the time, going against popular opinion). When I watch just this scene (never mind the entire movie) I’m both baffled by its original critical response and I understand it. 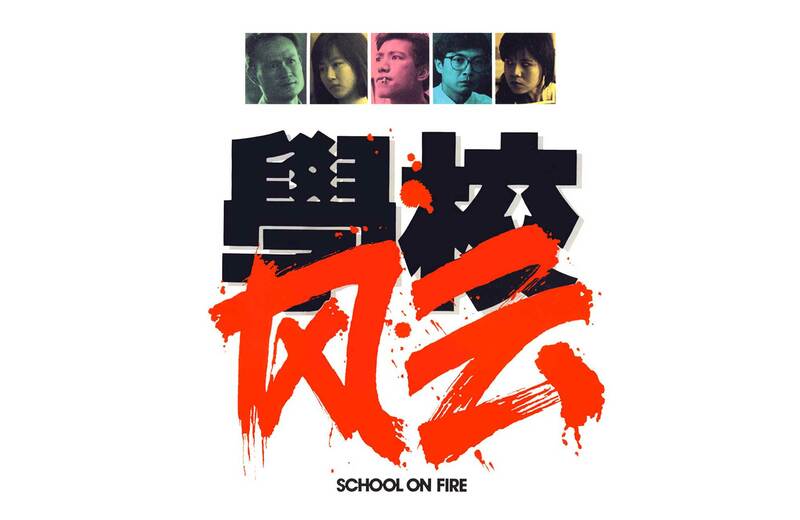 This is not merely a kid’s movie; this is a work of art, one that stirs up varied emotions, some of them disturbing. And certain kinds of viewers and critics don’t like to feel uncomfortable when a cute, imperiled pig is talking. When animals are anthropomorphized, many want the adorable creatures to make one smile or to tug at their heartstrings, not to burrow into one’s subconscious, making one ponder their existence in this awful world. That might sounds like hyperbole but I mean it. 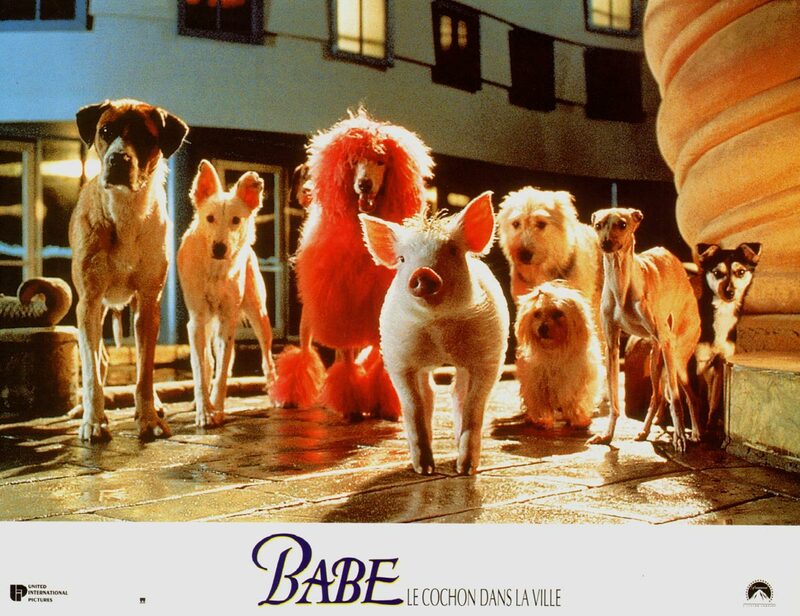 Babe: Pig in the City, through narrative and superb, unique, incomparably Miller-esque visuals (cinematography by Andrew Lesnie), works on that kind of existential level. Miller even makes Babe’s life flash before his eyes. Why? Miller does not sugar coat this overwhelmingly moving moment or question (asked with eyes). Babe is not given an answer – the dog lunges at him intending to kill. He does not care about Babe’s tender query and Babe goes hurtling into the water. And then, just when you think you’re emotionally spent, Miller doubles down and makes us feel for, not just Babe, but for the attacker. The dog is caught on the bridge from a chain, dangling over the water, getting closer and closer to drowning – Miller holds on the scene for a long, uncomfortable time, enough to where we see the dog’s head submerged in water. The other animals go back inside, intending to allow the dog to die. But Babe, freshly out of the water, his fur ruffled up and wet, sadly gazes at this creature – the pig cannot allow his attacker to perish. He saves him. The way the earnest orangutan (James Cosmo) hears the splash and watches little Babe swim to the pooch’s rescue – my god – why is this so moving? Even the way Babe is lit is moving. It’s a beautiful moment, a powerful moment, and it serves as a gorgeous centerpiece to the entire movie. We already love Babe, we feel for his vulnerability and sweetness, we see him be polite, we see him try to help, we see him make mistakes that aren’t his fault, and we even see him do as he’s told, but in this position, he will save a life. Even a life that’s just tried to kill him. 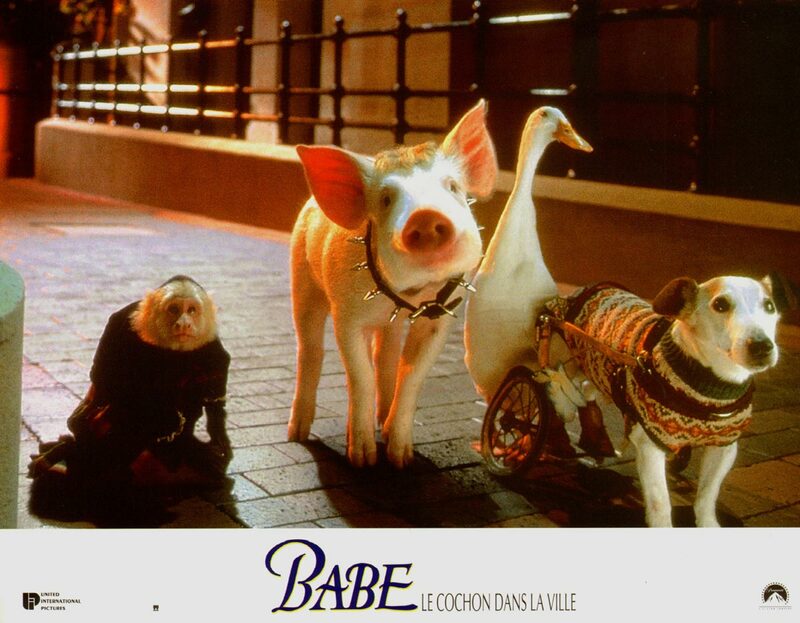 It’s the picture’s bold vision in story and design (the city design is masterful – a collection of world cities in one expressionistic skyline – Babe is indeed, encountering the world) and Miller’s uncompromising darkness, mixed with the movie’s gentleness that makes Babe: Pig in the City so different. It’s genuine, not corny. Sincere. Being this sincere isn’t as easy as it looks, and set against such harrowing moments, the picture’s poignancy feels hard-earned and lived-in, not tacked-on and cheaply sentimental. There’s so much care and creativity in this movie and Miller (who produced and co-wrote the first, wonderful Babe) knew not to repeat the same story. 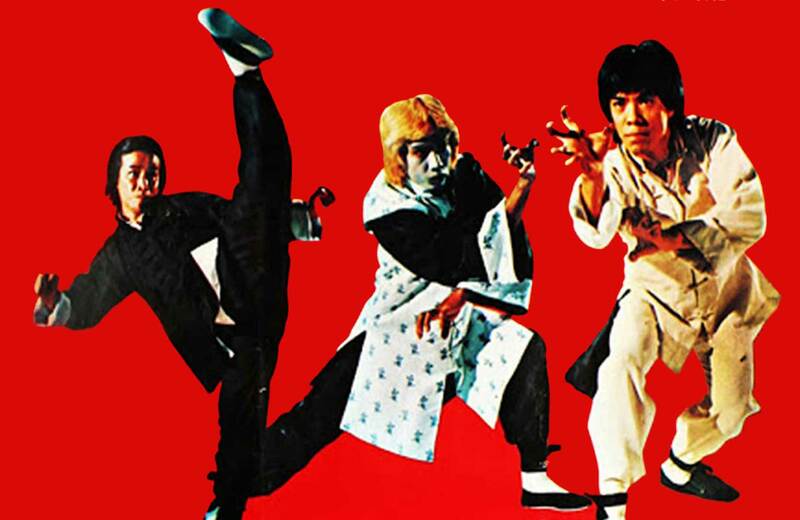 That lack of repetition was one of the reasons some critics and viewers were against the movie. They asked: Where’s the farm? Where’s the farmer (James Cromwell)? Why are we in this crazy, dark, imaginary city? Why is Mickey Rooney a creepy, sad clown? Because like Fury Road, Miller did not rest on his laurels and repeat himself, even at the risk of confounding or upsetting viewers. You should feel a bit upset while watching Babe: Pig in the City. And you should feel something new, your emotions whirling all over the place. It’s much like, if you came to see Tom Hardy as Mad Max, great, but here is Charlize Theron as Furiosa, she’ll take you through this movie. If you came to Pig in the City to see Babe with the farmer (James Cromwell), here’s his resourceful, apple-cheeked wife, Esme (Magda Szubanski) taking over. (Women have always been a very human force in Miller’s world – Tina Turner in Mad Max Beyond Thunderdome, The Witches of Eastwick and Lorenzo’s Oil are chief examples). Watch these outsiders, oppressed in an unsparing world; attempt to return to their Eden (if they’ve ever known one) and out of this dystopia. You also watch a menagerie of new characters – chimpanzees (Glenne Headly, Steven Wright and Myles Jeffrey), a choir of singing cats and a Blanche DuBois-inspired pink poodle (Russi Taylor) possibly a prostitute or involved in something where she’s felt used and abandoned (“I know you’re different from the others,” she says to Babe, “Those that have had their way with me make their empty promises, but they are all lies – lies.”) And you’re going to meet a lovable, disabled Jack Russell Terrier (Adam Goldberg) whom Miller puts so close to death in one scene that the dog actually visits heaven, playing with butterflies, his back legs healed and happy. (If you’re not crying in that moment, I can only say that you possess a heart of stone) With that, a focus on sheepherding is not going to happen in this shadowy world. You wouldn’t think it when the picture opens – it begins where the last picture ended – Farmer Hoggett (Cromwell) is intent to resume his normal life after he and Babe have become somewhat famous. Babe’s intent is to continue helping his beloved Boss, but (in a truly sad scene) as the pig’s work to aid in repairing a well backfires, Hoggett is injured and can’t tend to the farm. Esme can’t run the farm by herself, even as she tries, and the bank is closing in to take it away. So it all goes sideways pretty quickly – and Esme is off to the city with Babe, hoping to earn money at a sheepdog-herding contest in a fair far out of town. 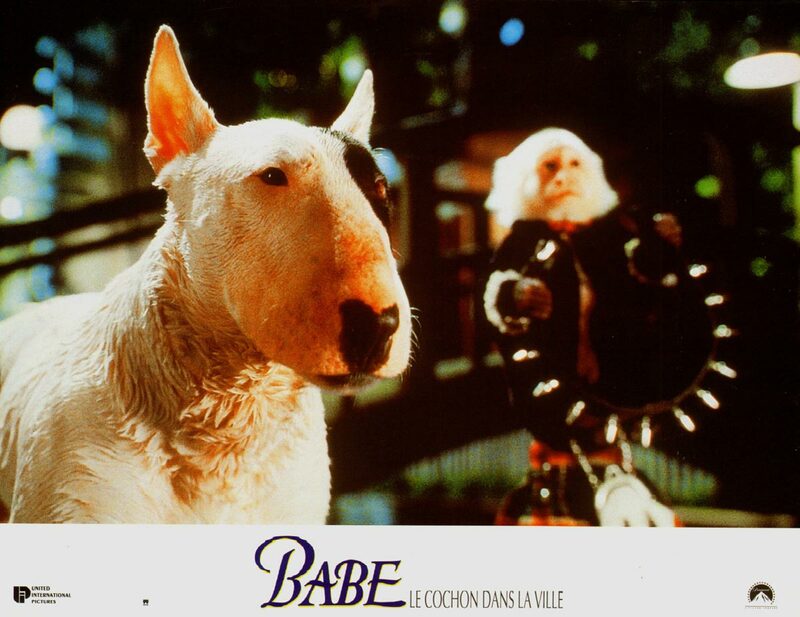 If you think the movie is going to be about Babe in that contest, Miller upends that expectation as well. Esme and Babe are trapped in the airport after she’s mistaken as a drug mule, and soon Babe’s alone in a pet hotel, meeting a family of chimps, (Steven Wright, Glenne Headly and Myles Jeffrey) and orangutan Thelonious (Cosmo) working for a clown – Mickey Rooney’s bizarre, unlikable and, yet, weirdly poignant Fugly Floom. That comforting dream is what some wanted from Babe: Pig in the City, but what is comfort, what is happiness, without experiencing darkness, even a nightmare? How will you know what any of that means without opposition? And, like the darkest fairy tales, the picture understands that life isn’t fair. That does not mean you should be tougher and meaner as you untangle your way through life’s indignities and struggles, however. In Miller’s universe kindness is the tough, radical act. That seems so simple, but it’s not. It comes burdened with responsibilities and fragility – of risking heartbreak.